So, since I’ve always enjoyed walking or cycling along the river to let off a little steam, this space has become a great stop for me to read the book I’m carrying or to simply observe and relax for a little while. The actual spot is the upper floor on the front face of the building, which due to its curved structure often has has spots in the shade as well as in the sun! 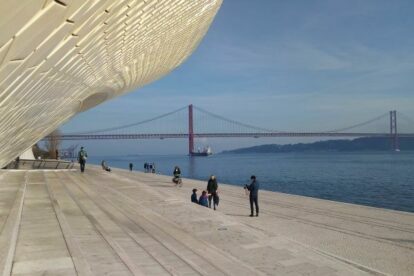 I love to just sit back, breathe in the sea breeze and observe Lisboners and tourists walking along the river. A ticket is not required to go up to the rooftop. If, however, I feel like moving a little and enriching my cultural and artistic self, I walk in. MAAT hosts and curates several exhibitions on various realms like art, electricity (the Electricity Museum is part of this space), film and so much more. Different workshops and courses are held at MAAT, such as a robotics for beginners, drawing, etc. They vary throughout the year and it’s a great space for learning.